Over time, you might need to set up the Calendar Publishing Host on a different Web server with a different IP address or port number. 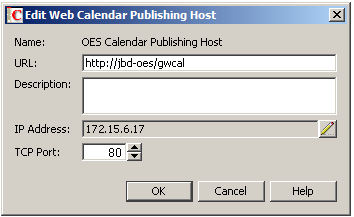 If necessary, install the Calendar Publishing Host to a new Web server, as described in Installation . In ConsoleOne, select the GroupWise System object, then click Tools > GroupWise System Operations > Web Calendar Publishing Hosts. 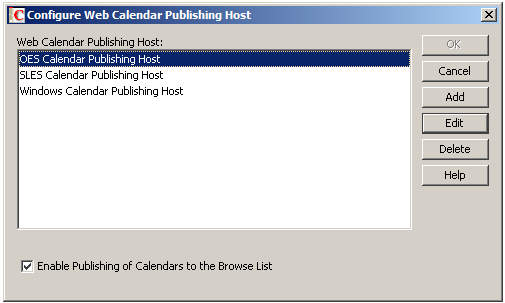 Select the Calendar Publishing Host whose configuration you need to change, then click Edit. Do not change the URL unless absolutely necessary. Changing the URL would invalidate the URL that GroupWise users have sent to Internet colleagues to access published calendars and free/busy information. Modify the IP address or port number as needed, then click OK twice. Restart Tomcat where the modified Calendar Publishing Host is installed, as described in Restarting Tomcat. Restart the POA so that it picks up the updated configuration information for the modified Calendar Publishing Host. Make sure that users can still access the Calendar Publishing Host by following the procedures provided in Testing Calendar Publishing .